Submitted by Fred on Wed, 12/05/2012 - 8:27am. 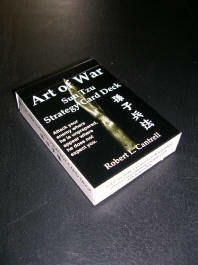 I pulled the seven of spades from The Art of War Sun Tzu Strategy Deck titled, “Engage Your Adversary From Many Directions” Strategy, see a decisive result with two or more coordinated actions. Basis, an adversary’s response to one action may leave him vulnerable to another. Swarming is described as engaging an adversary from all directions simultaneously. The technique is nothing new. The origins of swarming tactics were taken from watching the animal kingdom. Insects, like bees and hornets, and animals like wolves and sharks, defeated much larger and stronger animals by converging from many directions. Attempts to thwart an attack from one direction create vulnerabilities from others. Alexander the Great and Genghis Khan used the techniques to outwit, outpace and out maneuver larger and more highly trained adversaries. Swarming tactics have been used by law enforcement in handling officer needs help calls and are a favored tactic in dealing with active shooters. Can we in law enforcement combat and defeat dispersed and maneuvering adversaries with a swarming type of response? Will this technique work for the first responders, the street cops responding to ongoing deadly action, active shooter situations where minutes, if not seconds, weigh heavily on the death and injured count? With the right training and development I believe we can use this technique with highly effective results. How do swarming tactics work? An example; instead of responding and massing at side 1 of a location under attack, forming a four-man diamond and entering as a group, and moving to contact to stop the threat. Instead the first responder to arrive on scene enters solo. A back-up responds to side 2, and enters. Then the next responder enters on side 3 and the fourth responder enters on side 4 (not necessarily in that order). In other words, we respond and engage the threat by dispersing and then converging on the threat, cutting off the shooter(s) mobility and his access to more victims until we stop the threat. This is known as a “dispersed swarm.” Another variation of swarming is the “massed swarm” which forms after all responding officers have massed on side 1 (or any of the other sides), enter, then disperse and converge on the threat. Because of the difficulties in controlling the larger number of people maneuvering involved in swarming more emphasis must paid to implicit communications and collaboration with bottoms up decision making than to explicit communications and top down command and control. This allows those closest to and dealing with the actual threat to act semi-autonomous as they explore and adapt to the opportunities as they present themselves. I cannot stress the necessity for high-levels of training and discipline when employing swarming tactics.